Jamie is a friend of the Barbie family, she is the same size 11 1/2" tall as Barbie and shares her wardrobe. Below are the only two gift sets for Jamie that included tagged clothing, other than her original outfit, which was also featured in the # 1584 gift set of 1970-1971. Sears Exclusive Jamie Doll only - has blonde, brunette or titian medium length hair in a flip style, sold only at Sears, she has a press plate on her back, when pressed her head, arms and legs move giving the impression of walking. Yellow knit dress, nylon scarf, attached elastic belt and orange vinyl boots completed her outfit. 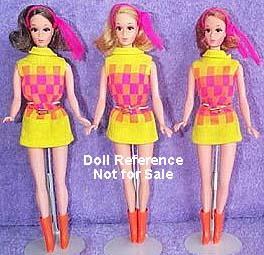 Marking: ©1967 Mattel, Inc. U.S. Pat Other Pats. Pend. Pat. Canada 1967 Japan. 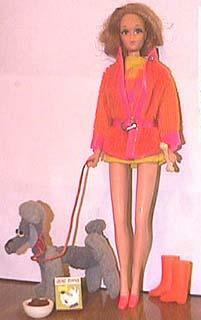 Furry Friends Sears exclusive gift set, came with the 1132 Jamie walk doll with a yellow knit dress, orange boots, scarf, plus orange furry coat and hat, pink pilgrim shoes, a gray poodle dog with pink collar and leash, yellow dog bowl, food box and bone. Same marking as the 1132 doll. Jamie still has the knit dress, now done in red, blue and yellow, with a blue scarf and red boots, plus a two piece blue knit pantsuit, blue chunky shoes, beach ball in blue and yellow and a white furry poodle dog with blue collar. Same marking as the 1132 doll.